The inhospitable climate of the polar regions means that suitable shelter is vital for an expedition’s success. 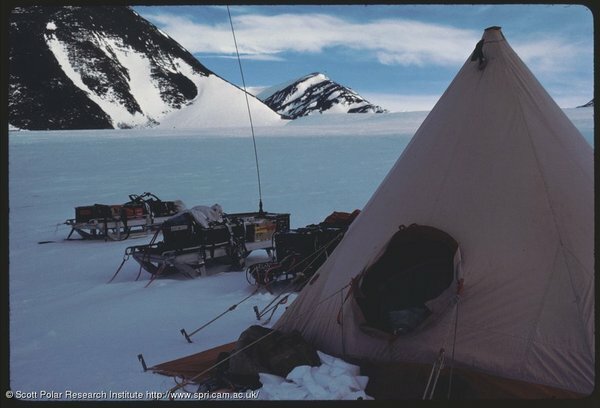 It is typical for an expedition to use two forms of shelter, firstly a base hut at their main site of operation and then tents when out in the field. During the period covered by the Freeze Frame project we see recorded some landmarks with regard to shelter, ranging from the first ever hut built in Antarctica in 1898 to the first permanent inland base on Antarctica, established in 1956. Explorers usually plan in great detail how they will shelter when in the polar regions, but there have been instances on expeditions when circumstances have caused the best laid plans to be abandoned. In times like these, polar explorers have shown great ingenuity in fashioning themselves a shelter with whatever materials happened to be at hand. Prior to 1898, expeditions that wintered in the polar regions would live on board their ship, frozen into the ice. In 1898 this changed, when the British Antarctic Expedition led by Carsten Borchgrevink wintered on Antarctica without their ship. The plan was for the group of men to build a hut in which to spend the winter, whilst the ship would leave them to resupply, returning to collect them almost a year later. At the time, this caused a great stir; many thought the party would never be seen again, but overwintering without a ship in the vicinity was to become commonplace. 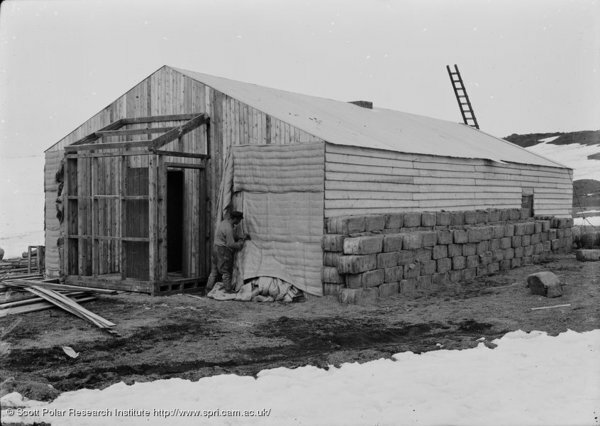 Since then, the hut has been the most common polar shelter used by any expedition. Many of the polar huts built during the heroic age of exploration still exist today. 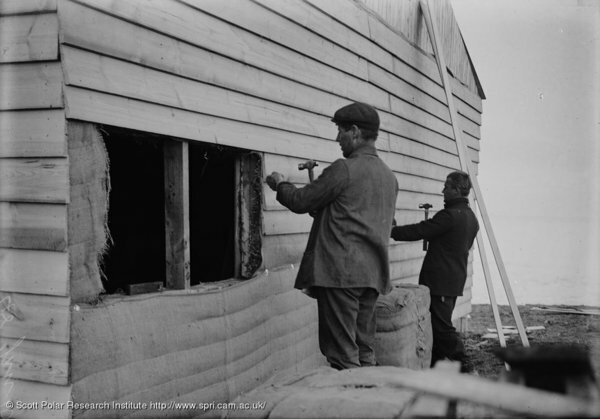 The New Zealand Antarctic Heritage Trust and the UK Antarctic Heritage Trust act as guardians for huts in the Antarctic, raising money to pay for the conservation of the huts, which are deemed to require special protection. Polar huts are designed to keep heat in whilst providing as much space as possible, using an extremely limited amount of material. Huts built during the heroic age were primarily made of wood. These wooden huts would be simple in design, usually consisting of one main room and a couple of smaller rooms, often a dark room, store room or taxidermy room. More recently, expeditions such as the Transglobe Expedition (1979-82) have used materials such as cardboard which have worked surprisingly well, whilst being very light. Today, the permanent bases in the polar regions use a whole host of materials to complicated structures, for example the Amundsen-Scott base at the South Pole is built on top of hydraulics which can lift the base above rising snow drifts. It is unlikely that the men for whom the base is named could ever have imagined such a structure. Building the foundations of a hut has always been a challenge due to the unstable nature of the ground on which they are built. The Norwegian British Swedish Expedition (1949-52) carefully selected an area which they dug out to a least half a metre, on which they laid the hut’s foundations. The foundations were heavy string-pieces and sills frozen into the snow. 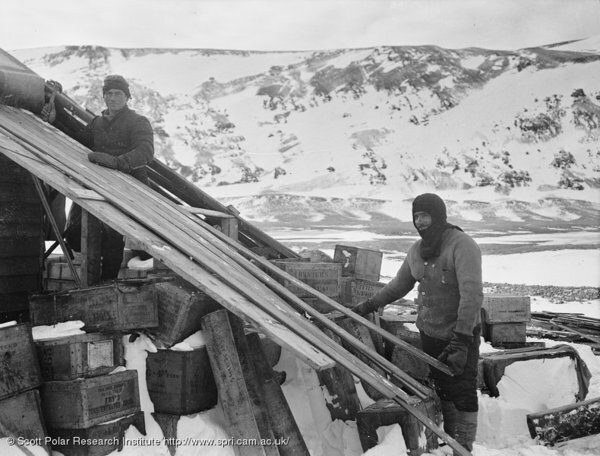 Each hut was made by bolted wood frames anchored to the snow by long bolts passing through the sills and then set in ice. In addition, two wire cables went over the roof and were anchored to deadman bolts. The frames were then covered with planking and the interior with masonite boarding. Today, bases are built with structures that allow for flexibility and so the structure is able to move with its foundations rather than shearing or cracking. Building a hut was once a time consuming practice. During the heroic age, men would live on their ship or in tents whilst the hut was constructed, usually to a prefabricated design. This would involve building a frame and nailing on the planks of wood and insulation. 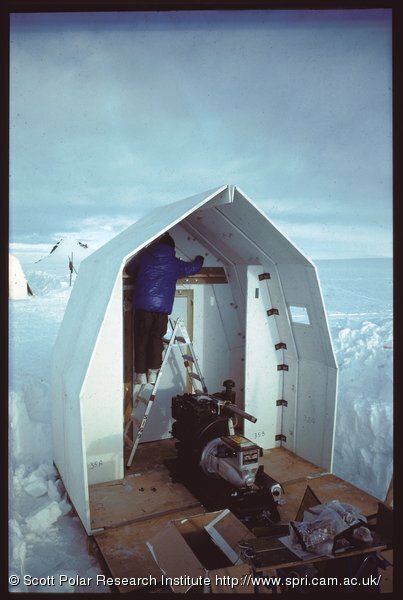 Later expeditions also made use of prefabricated designs, for example the Operation Deep Freeze (1955-56) and the Transglobe Expedition (1979-82) both brought ready-made panels that could easily be affixed to frames, speeding up the construction process. 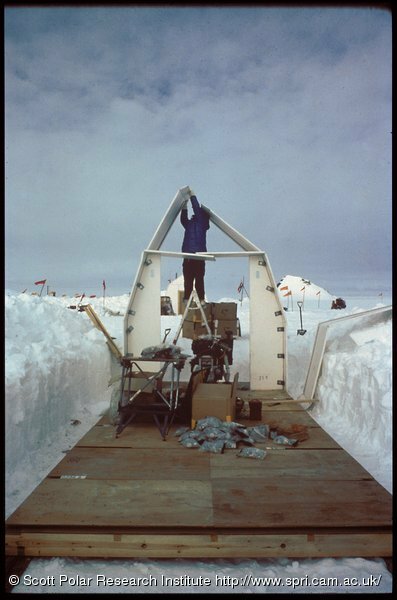 The Deep Freeze expedition even practiced putting up the huts in large freezers, so they knew what the experience would be like. As time has gone on, hut designs have become more complex and a lot has been learnt from the trial and error of previous expeditions. For example the Norwegian British Swedish Antarctic Expedition learnt from previous expeditions that screws and nails could stick to the fingers in such cold weather. The expedition coated the screws and nails with ‘Kilfrost marine paste’, which allowed them to pick up objects without the metal freezing to their fingers. Outer planking of shallow channel cross-section, with joints covered by channel-battens. Air space of 28mm wide divided into cells by strips supporting the outer planking. Layer of impregnated composition boarding nailed to the framework. Two layers of cork each 4cm thick, fitted between roof spacers and beams as well as wall studs with an air space between the layers. Layer of aluminium reflex paper. Layer of Masonite boarding nailed across the inner framework. Furthermore, an additional floor was laid inside to insulate the base of the hut. To make the most of the insulating properties of air, an air space was created by resting the secondary floor on blocks. This wooden floor was fitted with the shallow compartments that were filled with rock wool (a form of insulating material) and covered with Masonite boards. The joints between the boards were then sealed with gummed paper and the spaces packed with rock wool. A gap of 10cm was left between the edge of the floor and the walls, this was fitted with a hinged board which allowed them to increase or decrease the ventilation as required. As all the building materials for polar huts need to be brought with the expedition, this determines the size of buildings. The design of polar huts often requires an ingenious use of space. The men would typically share one room in which they would undertake activities such as eating, sleeping, socialising and carring out general repairs, such as mending sleeping bags. Activities like developing photographs or conducting scientific experiments would require a separate dark room or laboratory. 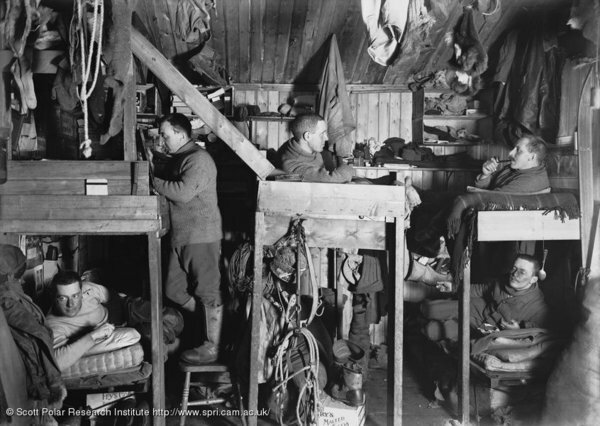 In general, the men would sleep in bunk beds to make the most of the available space or, as in the case of the British Antarctic Expedition (1907-09), the hut was broken up into small cubicles in which two men had bunks and a little space. As the same space would be used for a number of purposes, various techniques would be used to redefine the space. For example the British Antarctic Expedition 1907-09 had a narrow space between the cubicles where a dining table was placed; this was a trestle design which meant that the table top could be hoisted up into the ceiling to create more space once the meal was over. At first, the men would place the cutlery boxes on the table and the hoist up the top, but after a number of near misses with cutlery falling off the table as it was brought down, this practice was abandoned. The living accommodation also had to act as a storage space. The British Antarctic Expedition (1898-1900) built a loft in their hut to store items that needed to be kept warm, taking advantage of heat rising from the main room below. Others would use items which needed to be stored as building materials. The early expeditions were limited in the amount of weight which their ships could safely carry and so building materials would be kept to a minimum. Using stacked packing cases as walls not only provided further building materials but also enabled these items to be stored until needed. This also had the additional benefit that once the packing cases were emptied they could be used as lockers, creating further storage space. The need for privacy had its problems. On July 24 1899 the hut at Camp Ridley (named after Borchgrevink’s mother) was nearly destroyed, as a candle left burning in a bunk set the structure on fire. Much damage occurred before the flames were extinguished. On the night of August 31, Hanson, Ellifsen and Bernacchi were nearly asphyxiated by carbon monoxide as they slept. Coal had been left burning in the stove and luckily Bernacchi woke up in time to throw open the door, saving the men from death. The United States Navy Antarctic Expeditions, Deep Freeze (1955-56) was the expedition which was to result in the first permanent station built at the South Pole. Until this point, there had been concern that snow at the South Pole would be too soft to allow planes to land. If planes would be unable to land, it would not be possible to fly in the supplies necessary to build a permanent station or to drop them. A flight was undertaken to the South Pole demonstrating that it is in fact possible to land, giving the go-ahead for the following years’ activities, amongst which would be the building of the first South Pole station. Between 1956 and 1957 eighteen men were the first to winter at the South Pole in a Navy built station. 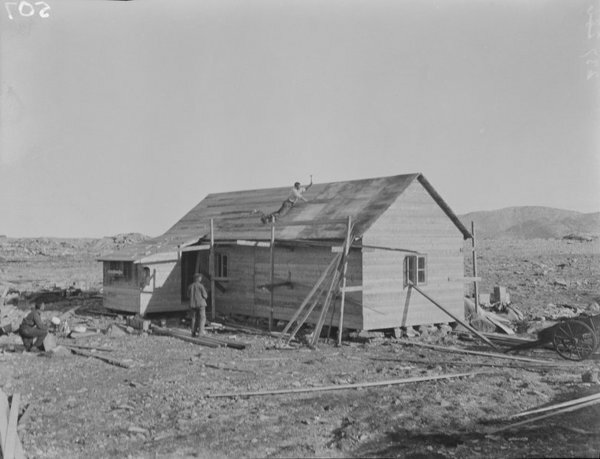 This small station was basic in comparison to today’s stations, but it paved the way for continuous scientific activity based at the pole itself. By the late 1960s the base was in need of updating and so a new station was built, opening in 1975, and a further station opened in 2003. The first South Pole station now lies buried under the snow, having been crushed by pressure from the ice sheet. The American’s scientific station at the South Pole is called the Amundsen-Scott Station in memory of the two polar explorers first to the South Pole. This entry was posted on Thursday, November 6th, 2008 at 11:32 am	and is filed under Resources, Shelter, Survival in Extreme Environments. You can follow any responses to this entry through the RSS 2.0 feed. Both comments and pings are currently closed.